The Israelites, as described in the Hebrew Bible, were the descendants of the patriarch Jacob, later known as Israel. Jacob's 12 sons formed the 12 tribes of Israel after emigrating to Egypt. Under the leadership of Moses, they left Egypt and conquered the land of Canaan, forming the nations of Israel and Judah. When the Kingdom of Israel was conquered by Assyria in 722 B.C.E., many people of the northern tribes were taken into exile. Others emigrated to Judah, while still others intermarried with colonists imported by the Assyrians. In the sixth century B.C.E., Judah was conquered by Babylon and many of its leading citizens were taken into captivity. Their descendants later returned and became known as the Jews. In the biblical account, the Israelites were the people chosen by God as the people of a special covenant, or agreement, according to which God would bless them and their descendants in exchange for their obedience to certain laws, customs, and attitudes. Believers in Jesus affirm that the new covenant was established between God and the Christians, who are therefore a type of spiritual Israelites. Several other groups claim to be "Israelites" in the literal sense of being physically descended from Jacob. Although Judaism allows people to join its faith from any ethnic background, most Jews today are the descendants of the Israelites, as are the Samaritans, only a few of who still survive. However, there are modern historical debates about the true origins of the Israelites, with many scholars doubting the story that all Israelites were originally descended from Jacob. According to the Hebrew Bible, the Israelites were the descendants of the sons of Jacob, who was later known as Israel. His 12 male children were Reuben, Simeon, Levi, Judah, Issachar, Zebulun, Dan, Gad, Naphtali, Asher, Joseph, and Benjamin. In the biblical narrative, the sons of Jacob all migrate to Egypt where one of them, Joseph, has become the prime minister. They remain there for 400 years, during which time they multiply to become the 12 "tribes of Israel." Together, they leave Egypt under the leadership of Moses, during the Exodus. The tribe of Levi is set apart during this time as a priestly class to assist the sons of the high priest Aaron and attend the Tabernacle which the Israelites carried through the wilderness. After 40 years in the wilderness, the Israelites finally reach Canaan and conquer it. The tribe of Joseph was divided into the two half-tribes of Benjamin and Manasseh, and the tribe of Levi, rather than possessing its own territory, served as a priestly group scattered in towns belonging to the other Israelite tribes. 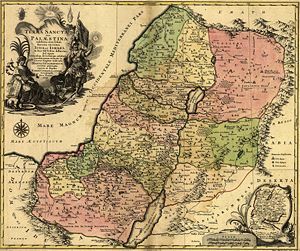 1759 map of the tribal allotments of Israel. The final chapters of the Book of Numbers and the entire Book of Joshua describe the initial conquest of Canaan by the Israelites under the leadership first of Moses, and then Joshua. The Book of Judges describes the Israelites' struggle to establish a national foundation as they face military opposition from the native peoples, temptation from Canaanite religious practices, and war among themselves. The prophet Samuel emerges at the end of the period of judges and anoints the Benjaminite Saul as the first king of "Israel." Soon, however, God rejects Saul, and Samuel anoints David, who leads a band of Judahite outlaws that ally themselves with the Philistines until Saul's death. Through a long civil war with Saul's son, Ish-bosheth, David eventually becomes the second king of Israel, but he faces several rebellions in which the northern tribes and even elements of Judah reject his leadership. David's son Solomon succeeds in creating a more truly united kingship, although the northern tribes bristle under heavy taxation and forced labor for building projects in the capital of Jerusalem. 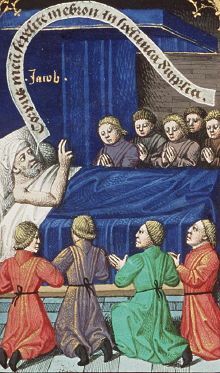 After Solomon's death, a labor dispute occasions the loss of the ten northern tribes by Solomon's son Rehoboam. Thereafter, the northern tribes are known as "Israel" while the southern kingdom is known as "Judah." A religious dispute between the two kingdoms centers on the question of whether all Israelites must worship in the Temple of Jerusalem, or whether northern tribes can make their offerings and pilgrimages at northern shrines and local high places. Judah was populated by the tribe of Judah, most of Benjamin, some of Levi (who acted as priests and guardians at the Temple of Jerusalem) and also remnants of the tribe of Simeon, most of whom probably were assimilated into Judah early on. The northern kingdom was the more prosperous and powerful of the two, but the southern kingdom—according to the biblical writers—possessed a stronger sense of spiritual devotion to Yahweh. In 722 B.C.E. the Assyrians under Shalmaneser V conquered the northern Kingdom of Israel, destroyed its capital of Samaria and sent many Israelites into exile and captivity. In Jewish popular culture, the ten tribes disappeared from history, leaving only the tribes of Benjamin, Judah, and Levi to eventually become the modern day Jews. In 607 B.C.E. the kingdom of Judah was conquered by Babylon, and leading Judeans were deported to Babylon and its environs in several stages. Some 70 years later, Cyrus the Great of Persia, who had recently conquered Babylon, allowed the Jews to return to Jerusalem in 537 B.C.E. and rebuild the Temple. By the end of this era, members of the Judean tribes, with the exception of the Levite priests, seem to have abandoned their individual identities in favor of a common one and were henceforth known as Jews. While Jewish history refers to the northern tribes as "lost" after this, the remnant northern Israelites, who had largely intermarried with people brought in by Assyria, were reconstituted as the nation of Samaria. Disdained by Jews because of their mixed lineage, they refused to worship in the rebuilt Temple of Jerusalem, believing that God had commanded the Israelites to establish a central sanctuary at Mount Gerizim in the north. Samaria continued to exist as Judea's rival for several centuries, and its people were known as Samaritans. Suffering persecution under Rome, then under the Christian empires, and finally by Muslim rulers, the Samaritans nearly died out. Today a small population of Samaritans, with its priesthood and sacrificial traditions still intact, continues to exist in Israel and the West Bank. 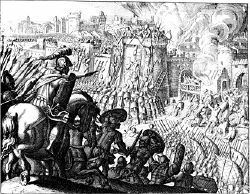 The Jews, meanwhile, were scattered after a rebellion against Rome 66 C.E. ended in the destruction of the Temple and the expulsion of the vast majority of Jews from the capital. A further rebellion in the second century under the messianic leader Bar Kochba led to a near complete diaspora. While some Jews remained in Palestine many moved east to the cities of the eastern Roman Empire, west to Alexandria and Africa, and north into Asia Minor and southern Europe, eventually making their way to northern and eastern Europe and the United States. Jews comprise several ethnic groups and have been found as far from Israel as China. The Jews of Europe faced near annihilation in World War II when Adolf Hitler's Third Reich planned their complete extermination. Due to the victory of the Allies, however, they survived, and the state of Israel was established in 1948 as a safe haven for holocaust survivors and other Jewish refugees. Archeology and modern biblical studies challenge the traditional view of Israelite origins as lineal descendants of Jacob. For example, it is doubted that an Exodus of slaves from Egypt would have simply contained direct descendants of Jacob. Egypt had slaves from all surrounding areas and they likely mingled and worked together. Therefore even if a group of escaping slaves came to be called Israelites because of its leadership and narrative history, it would not necessarily be genetic Israelites. Exodus 12:38 itself stipulates that when the Israelites left Egypt, "a mixed multitude went up with them." Also, rather than a migration en masse out of Egypt and a conquest of Canaan within a short period, a much more gradual process is envisioned. Moreover, many scholars believe that several, perhaps most, of the Israelite tribes never migrated to Egypt at all. The archaeological record is missing any evidence of a large migration from Egypt to Canaan (said the Bible to include 600,000 men of fighting age or at least two million people in all), while even relatively small bands of migrants usually leave some evidence of their travels. Moreover, the supposed period of Israelite conquest shows little evidence of the rapid succession of decisive victories described in the Bible. Rather, it seems that Canaanite and Israelite cultures were virtually indistinguishable during the period in question, and what appears to have occurred was a process of gradual infiltration or emergence of Israelite culture into Canaanite society. The existence of a group known as "Israel" in Canaan is confirmed by a stele left by the Egyptian ruler Merneptah, (reigned 1213 to 1203 B.C.E.). This is the first historical reference to Israelites outside of the Bible. Merneptah boasts of having devastated "Israel" and several other peoples in Canaan at a time when most scholars believe the Exodus had not yet occurred. Accordingly, a prevalent theory has emerged that many proto-Israelites did not come from Egypt but must have lived in the area of Canaan and later joined the emerging Israelite federation at a later date. According to this theory, the late-comers were adopted in the "people of Israel" and in turn adopted the Israelite national origin stories in a similar manner to the way more recent American immigrants identify with the story of the British colonists coming to the new world in search of freedom and prosperity. A number of theories have been put forth regarding the identity of the Israelites and the process by which Israel became a nation. The tribe of Joseph (later Ephraim and Manasseh) is often identified as a group which did spend time in Egypt and later came to Canaan. The "Israel" referred to in the Merneptah stele may be the Bedouin-like wanderers known elsewhere as Shasu who, according to the archaeological record were the first group leaving evidence of worship of the Israelite God Yahweh. Literary critics suggest that Abraham, Isaac, and Jacob may once have been the patriarchs of separate tribes who were later fused into one "lineage" reflecting the growing unity of the "Hebrew" people. Similarly, each of the Israelite tribes may once have had its own independent origin stories, which later merged into the various legends of the Israelites. A careful reading of the biblical record itself indicates a far more complicated process than is usually assumed. The Book of Judges describes the Israelite tribes as very distinct from one another, often living in peace with their Canaanite neighbors, and sometimes warring against each other. In Judges 1, the non-Israelite clan known as Kenites joins the tribe of Judah. Earlier, in the Joshua 9, the Gibeonites, a Hivite clan, cleverly make peace with the Israelites and become their vassals. Another example of "adoption" may be seen in the Perizzites, who are usually named as a Canaanite tribe (Gen. 3:8 and 15:19, etc. ), but in Num. 26:20 are identified as part of the lineage and tribe of Judah, through his son Perez. The Bible affirms that several Canaanite tribes were never conquered but continue to live among the Israelites "to this day." Moreover neighboring peoples such as the Moabites and Edomites are called "brothers" to the Israelites and are allowed to intermarry with them, becoming fully part of the Hebrew congregation after three generations. Finally, the Israelites were allowed to take wives from among the people whom they conquered. Some modern religions maintain that their followers are "Israelites" or "Jews" although the meaning of these claims differs widely. In some cases, the claim is spiritual, but in other cases groups believe themselves to be actual physical descendants of the Israelites. In addition there are a number of anti-Semitic groups who claim that they alone are the "true" Israelites, while the Jews are evil imposters. Many Puritans and early settlers of New England viewed America as God's New Israel. The Latter Day Saint movement (Mormons) believe that through baptism and receiving the Gift of the Holy Ghost, they become "regathered" Israelites. Samaritans are a group claiming physical descent from the Israelites. Like the Jews, the Samaritans accept the five books of the Torah and the Book of Joshua, but they reject the later Jewish writers, as well as the later Israelite prophets, kings, and priesthood. They regard themselves as the descendants primarily of the tribes of Ephraim and Mannasseh. Recent genetic surveys suggest that their claim to lineal descent from the Israelites may indeed be valid (see Samaritans). Karaite Judaism includes people who once were accepted as regular Jews during the Talmudic period yet rejected Judaism's emerging tradition of Oral Law (the Mishnah and the Talmuds). There are approximately 50,000 adherents of Karaite Judaism, most of whom reside in Israel. Some communities of Karaites are also present in Eastern Europe. Rastafarians believe that the black races are the true Children of Israel, or Israelites. A number of other black Israelite movements also exist. The African Hebrew Israelites of Jerusalem (known in Israel as the Black Hebrews) is a small spiritual group whose members believe they are descended from the Ten Lost Tribes of Israel. Most members live in their own community in Dimona, Israel. A number of other groups claim to be the only "true Israelites" and condemn the Jews as imposter's to that status. ↑ In the biblical narrative Joseph's time in Egypt is told in detail, while the story of the migration of the other tribes to Egypt has the character of an addendum explaining how the Israelites all came to be in Egypt even though Jacob was known to be buried in Canaan. ↑ Conrad Cherry (ed. ), God's New Israel: Religious Interpretations of American Destiny (Chapel Hill, NC: University of North Carolina Press, 1998). Cherry, Conrad (ed.). God's New Israel: Religious Interpretations of American Destiny. Chapel Hill, NC: University of North Carolina Press, 1998. This page was last modified on 17 December 2018, at 20:23.